Nine months earlier, my husband and I had started what we were told was our best window of opportunity to conceive a child. I had just had a surgery followed by several months of hormone therapy. But, by spring, our doctor sat us down and explained that what we were doing wasn’t working. We needed to take more drastic measures before the window of opportunity was gone. We went home, discussed the options, prayed, and received what we feel was a very clear answer about what to do. I called and thanked my doctor for his efforts. And we started the application to adopt. By September, we’d completed our application in record time and were settling down for what we’d been warned would most likely be a very long wait. Part of the adoption application is a “preferences checklist.” It includes a list of possible health problems, as well as options about birthparents, race, etc. The training classes we attended emphasized the importance of really studying this list and selecting only those conditions that we felt we were prepared to handle. We followed the counsel and researched all kinds of possible health problems, but in the end, it all just felt silly. In our view, your child is your child. You don’t tell the Lord what your child should be like. You trust Him to put families together the right way. It’s about faith. And that’s what we told our caseworker when she pointed out to us that we’d left ourselves open to adopting a child with severe special needs. Because she’d warned us before that we’d hear of a lot of special needs adoption situations, when the phone rang that snowy morning, I was more surprised by the fact that the call was coming so soon after we’d been approved than I was to hear that this baby had health problems. Still, my philosophies did little to prepare me for reality. There I was, scribbling notes on my shopping list. 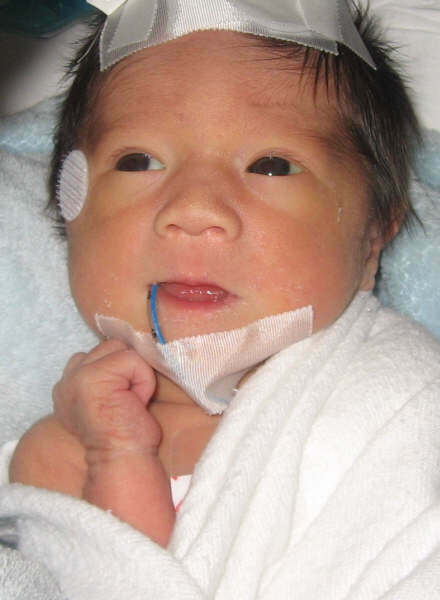 “Boy.” “October 31” “Korean” and then “Birth defect” This baby had a major birth defect. His intestines had formed outside of his body, a defect called gastroschisis. I guessed how to spell it as she went on. Next I wrote “1-2 years,” the child’s life expectancy and I could feel my heart breaking. She explained to me that he’d need to travel out of state for surgery and I wrote “Pittsburgh? Florida?” I asked a few questions, most of which she didn’t have answers for. Then, she asked me if I thought we’d like to be considered as parents. I told her that, obviously, I’d need to talk to my husband. She told me she’d send me copies of the e-mails she’d received with details and his picture. I hung up the phone and the tears started to flow. Sure, I’d checked the boxes saying that I was open to raising a child with special needs. But until you’re presented with a child and a diagnosis, you can’t begin to comprehend what that means. 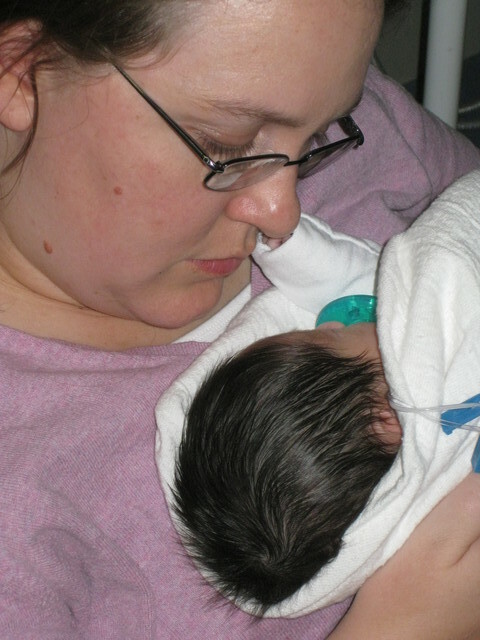 It had never even entered my mind that I could be mother to a child who might not live. Was I strong enough for that? I didn’t feel strong enough for that. The defect was so strange and, well, gross that I couldn’t wrap my mind around it. Had I really checked this box? And then the e-mail with information on the diagnosis came and I didn’t understand any of it. It had medical terms in it like “gastroschisis” and “parenteral nutrition” and “palliative care.” I didn’t understand them. It said that the child could only live two years, but even Wikipedia and google couldn’t explain why. But the baby boy in the picture sure was cute, even with an IV sticking out of the top of his head. His dark eyes seemed to be looking right up into heaven. The picture was titled “Patrick”. I remember sitting at my desk just starting at that picture and trying to decide if I was looking at my son. The next few days were a bit of a blur. After a thoughtful, prayerful day, my husband and I decided to send our profile to be shown to Patrick’s birth family. I’ll admit, I was scared to death. I knew then that my life as I knew it was over if we adopted this little boy. I couldn’t even imagine how I’d do it. And yet, I was surprised to find myself grieving for him, as though he were already my own. I spent the next few days bouncing between fear of being chosen as Patrick’s mom, and at the despair at the idea of not being chosen. We knew that whatever decision was made, we could never be the same. On Friday, we received word that Patrick’s birth parents had chosen us as parents, if we were willing. 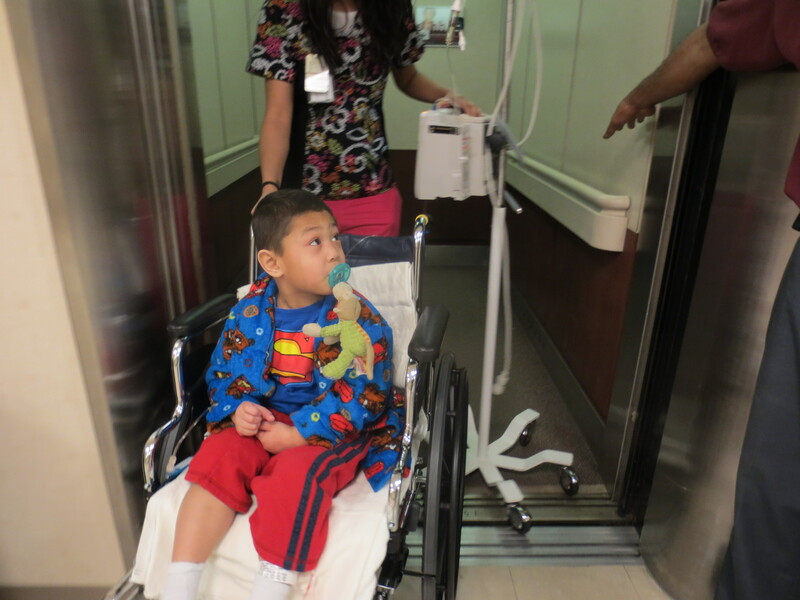 We finally started to be able to talk to hospital staff so that we could understand his medical condition. But the more we talked, the more we knew the information we were getting was still only a part of the story. So, Saturday we flew to Michigan to meet him, his family and his doctors. That first meeting was overwhelming. At last, we began to understand the extent of Patrick’s medical needs. And it was so much bigger than we’d ever imagined. 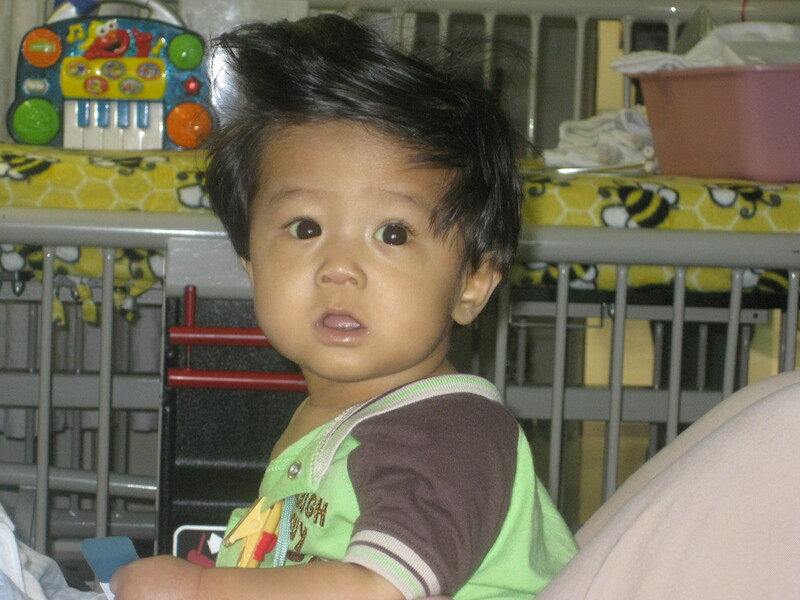 Patrick’s gastroschisis had been discovered in an ultrasound. Basically, his abdominal wall had not closed completely, allowing his intestines to form on the outside of his body. Most of the times, this can be corrected after birth. But, by the time a follow-up ultrasound was done, the intestines were no longer visible. Although no one can say for sure what happened, the doctors’ best guess is that the intestines twisted (called a midgut volvulus). That twist pinched the main artery that feeds the intestines. With no blood supply, the intestines died, fell off, and were reabsorbed. Because all of this happened in the womb without intervention, the loss was massive. Patrick was left without any of the vital portions of intestine that absorb nutrients. He had only the part of small intestine that connects the stomach to the rest of the small intestine (duodenum), just 15 centimeters long, and a fraction of his colon. Unable to get nutrition from food, Patrick is now fed entirely by IV, a method called Total Parenteral Nutrition (TPN). TPN has it’s consequences, though. It causes swelling and scarring in the liver that can lead to liver failure. And, because it requires an permanent IV, blood infections (sepsis) are a common if not constant problem. Most short gut patients are left with some intestine that can be rehabilitated and adapted and can eventually provide at least partial support. They can gradually wean away from IV feeding and be fed through a g-tube or by mouth. But the doctors told us, as they’d told his birth family, that Patrick did not have what was needed to sustain life. He could not be weaned from TPN with the anatomy he had. The only possible treatment option would be an intestinal transplant, a procedure so new and dangerous that it is only done at a handful of hospitals around the country. Still, his doctors said that they felt that Patrick was stable enough to be discharged from the hospital soon. Perhaps as soon as arrangements could be made. 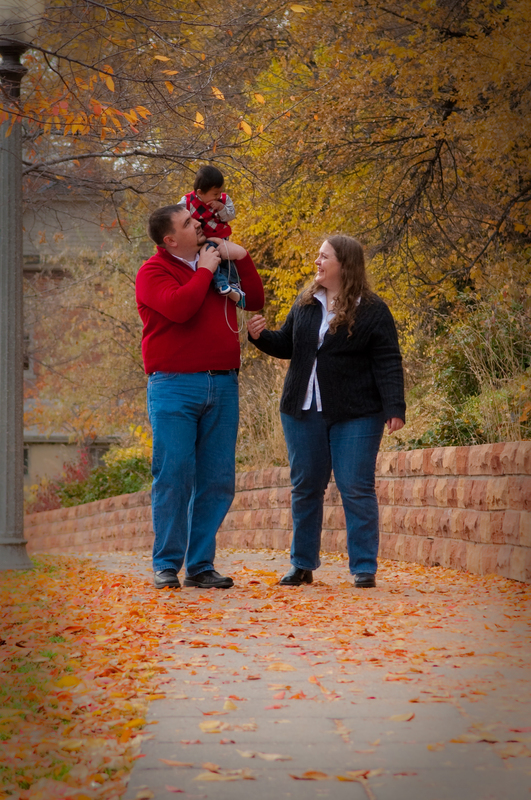 Of course, those arrangements required legally formalizing the adoption, moving Patrick home to Utah, and getting training, equipment and supplies to give TPN at home. With the full weight of the actual diagnosis sitting on our shoulders like a restless boa constrictor, we finally got to go meet Patrick. We scrubbed in then were led through the maze of the NICU. And then, there he was. Tiny. That was what I remember thinking when I saw him. He weighed just 5 and a half pounds and looked like a little ball topped with a pile of black hair in his crib. He was surrounded by monitors and other medical equipment but he, himself, looked so healthy. Holding him helped me appreciate how fragile he was. Besides all the monitor wires, he had a PICC line in his arm had a tube in his nose and one coming from his abdomen, both draining fluid from his stomach and gut. Getting all of this situated so it neither pulled nor spilled was a feat I didn’t accomplish on my own for several days. We stayed a few hours, visiting with his birth family and his nurses. By the time we made it back to the hotel room, it was very late, and I was overwhelmed. I just sat down and cried. All I wanted was to go home and go back to my life. I didn’t feel ready for any of this. Thankfully, we’d planned to stay a few days before we made our decision. By the end of the next day, I’d completely changed my mind. Patrick’s nurses told us that Patrick was a terribly fussy child. We never met a fussy Patrick. As long as we were there, he was calm. Perhaps he had been lonely or perhaps he had been scared. When we got there, I think he knew a family had arrived at last. No child should be asked to go through what he had ahead of him without a mommy and daddy to love and take care of him. All that day, his kind nurse answered our questions and let us do all of the hands on care possible. Many more doctors came to talk to us. Some were ecstatic at the idea of Patrick finally having a permanent family. They told us about other Short Gut patients they’d cared for. Others were grim about his prognosis and quality of life. The surgeon who had operated on him at birth was the most honest, but also the most pessimistic. He told us that if we proceeded with the adoption, we would most likely spend at least half of his life in the hospital. We’d be regulars in the E.R. Our relationship would be strained. And, even with our best efforts, Patrick only had about a 50% chance of living to age 2. We heard all this news, though, with little Patrick snuggled up in either my or my husband’s lap. Once you picked him up, you were committed to at least several hours. And in the quiet times, I sang to him. I could tell the lullabies he liked because his breathing steadied out on the monitor. His sweet spirit filled the room. And by that evening, my mind was set. I was in love with Patrick. Monday seemed like more of a technicality. We confirmed insurance coverage, found a GI near home, met social workers, talked to more doctors.. and then we held a small “family conference” and asked Patrick his vote. We took his contented smile in his daddy’s arms as a yes and signed the paperwork. 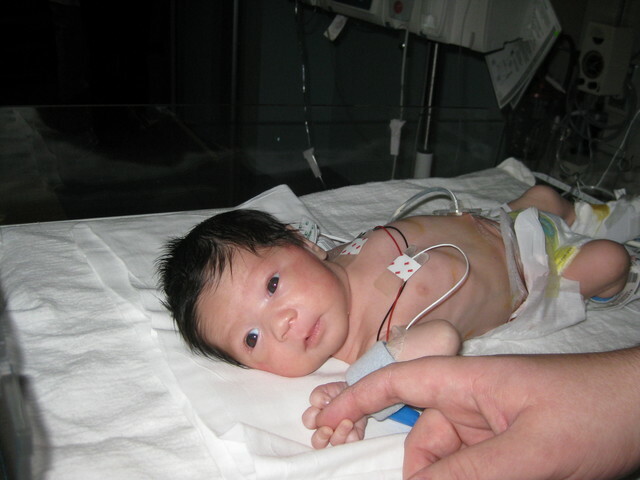 Patrick spent the next 2 weeks in that NICU while the courts worked on the adoption. I had nowhere else to go, except my hotel room, so I stayed with him from 7 a.m. till well past midnight most days. Most days were peaceful. Some days were hard. Surgery days were the worst. But, all that time helped me learn to understand the doctors when they talked, and it helped me learn to take care of Patrick. Then, with custody finally granted, we flew him back to Utah where he spent another 3 weeks in the NICU at our local children’s hospital. Most of this time was spent making arrangements for medical supplies, homecare, nursing, follow-up visits and all the rest of the care he’d need. 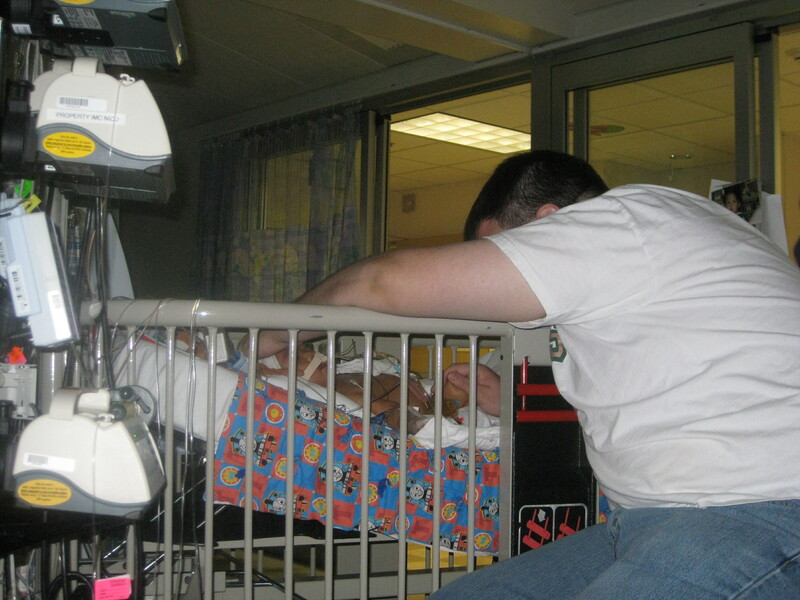 I still stayed by his bedside and did all the care they’d let me do. When the time came, the doctors were quick to give the go ahead for us to go home. I’d proven I knew how to care for him. Eventually, discharge day came. A nurse brought Patrick’s TPN, lipids, add-ins and pumps to us at the hospital and taught us how to use syringes to add medications to the TPN and then how to program pumps and connect it. Then, they took us to the car and we brought Patrick home. It did take several weeks and help from nurses, doctors, insurance case managers, a patient dietitian, and more to teach me all I needed to know. Caring for Patrick meant changing TPN and tubing every day, cleaning and caring for his g-tube, changing ostomy bags when they leaked, feeding him every 3 hours including through the night, charting his stool losses in proportion to his weight and giving appropriate replacement fluids, and more. But it became routine and we kept him safely at home for 6 months without any complications. That April, we flew with him to Seattle Children’s Hospital where he was evaluated and listed for an intestinal transplant. But as promised, that good health could not last forever. We soon learned what the doctors had warned us of. Patrick’s first summer he started to have line infections. The antibiotics allowed different infections to grow. It was a vicious cycle. One moment he’d be fine, and in a few hours have a raging fever, and by the time I’d get him to the E.R., he’d be in septic shock. The infections would grow in his central lines, so they’d have to be removed and replaced and soon placing IV’s and drawing labs became a difficult and tortuous part of every morning. During this time, I truly did live in the hospital, spending nights at home only on weekends whenever Patrick was hospitalized. Patrick and I became close friends with some of the nurses and doctors. My husband’s evening and weekend visits kept me sane. Eventually, all the infections led to a yeast infection so resistant that it required the maximum dose of a very dangerous drug. It made Patrick cold and sleepy and otherwise so miserable while it ran that I spent each day holding him through the 4 hour dose. Then one day, his little body couldn’t take it anymore. He got very sick and agitated, and then oh so still in my arms. His heart had stopped. Luckily, I was holding him and could call for help. CPR was started right away, a code was called. It took 15 minutes to revive him and then another 2 weeks in the PICU before his body started to recover. Miraculously, Patrick’s brain suffered only very moderate damage. And he was so young when it happened that his brain will be able to adapt to overcome most of the effects. He has difficulty controlling the muscles on his right side, so it took him longer than most kids to learn to crawl and to walk. The doctors call it mild cerebral palsy. He wears a brace and is in physical therapy. Muscle planning for tasks like writing, cutting, and playing with toys is also limited, though getting better with therapy. He receives speech therapy, because his brain has a hard time telling his mouth how to form words. He often struggles with impulse control and with handling the sensory information he receives from the world. With lots of help and lots of effort, he is improving and although he is delayed, is progressing. Life has been calmer since Patrick was discharged that August. He had another major surgery to reconnect his small and large intestines. And later another to reduce the dilation of his intestine. And he has a handful of line infections infection every year. Eventually, we found a way for Patrick to use ethanol locks in his central line, basically cleaning the inside of the line by filling it with alcohol for a few hours, and then removing it. With ethanol locks, the infections stopped coming as frequently. Still, infections do come and, more often than that, Patrick’s line is often broken and needs repair. And every time, we feel the looming threat of running out of veins to put new lines in. Patrick’s intestines are still quite unhealthy and we worry that dilation will come back. Patrick enjoys eating, but can only eat very small amounts and only limited foods, or it will make him sick. Yet, he loves to sit down and try new tastes and new foods. 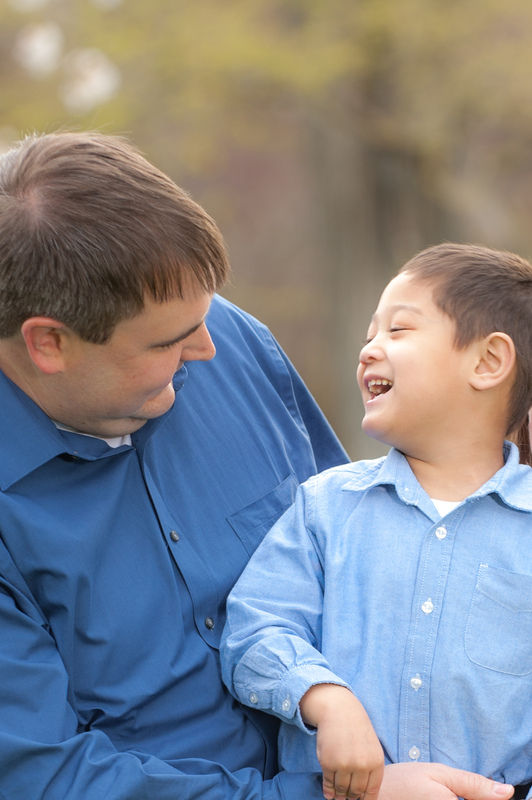 As a complication of his short gut, Patrick’s developed food allergies that have further restricted his diet. But these things have also become routine. To us, they are normal. Patrick is a very happy two-year-old. He is content with his life. He loves cars and crafts and Disneyland. He’s a thrill-seeker who can’t get enough of slides and wagons and other rowdy things. He’s a people person, constantly making me stop and talk to the strangers he meets. He has an eye for a friendly face. He loves to be read to. He’s learning to ride a tricycle. He’s stubborn as can be. And he has a very tender and loving heart. We don’t know if the transplant call will come before Patrick’s health starts to fail him again. His liver is scarred from the TPN. Any day he could pick up an infection that we can’t treat. And all of his lost central lines have caused lost veins, so we never know if this line will be the last they can find a vein to put a line in. We don’t know if the call came if it would be the solution, or just the start of a different kind of problems. Those are the things I don’t often let myself think about. Instead, I push the scary thoughts away as often as I can and focus on what we have now. I’ve learned to do things I never imagined. I never imagined that caring for IV tubing would be second nature to me. I barely have to think about it anymore. I never imagined doctors and nurses would ask me for advice on technique and treatment, or even more prefer for me to do it. I never, ever imagined I’d be teaching THEM. I’ve learned to handle syringes in a moving car. I’ve learned to change IV bags in the dark. I’ve learned to use sign language to communicate basic needs. I’ve learned to restrain a child with a pillowcase and my legs while keeping my gloved hands sterile. I’ve learned to pack for and navigate airport security with two days’ of medical supplies, including TPN. I’ve learned to recognize that “mom, my tummy’s sick” look before disaster strikes. And should I be too late, I’ve learned to contain and clean up vomit in a public place without crying. I’ve learned to prevent the ugliest diaper rash. I’ve learned to safely navigate a playground while connected to my toddler by just 10 feet of tubing. I’ve learned to answer what people should have asked, instead of getting angry at what they actually said. I’ve learned to rely on family and friends and to trust them to do things they never thought they would do. I’ve learned to see pain in another parent’s eyes. I’ve learned that I’m only alone if I choose to be. Most of all, I’ve learned to be happy, even when sometimes circumstances should dictate otherwise. Patrick has taught us that you can be happy, even when things are hard. I have learned more about life, about joy, about faith, about hope, about determination, and especially about love since meeting Patrick than in 29 years of life before. He has taught us to live life to it’s fullest, RIGHT NOW. Since we never know what tomorrow will bring, whenever a memory-making moment is offered today, we do all we can to take it. Doing so with all of Patrick’s medical equipment isn’t easy. However, this has led to some marvelous adventures and a wonderfully thrilling spontenaety in the midst of a life of structured chaos. After all he’s been through, I firmly believe that Patrick chose life. He chose it knowing his body would be limited. And so, I feel it’s my priviledge to do all I can to let him live his life to the fullest. One day, my phone may ring again. One day, our lives will change forever. Again. And it will all be ok.